New mobility is changing the way we move around cities. It’s also shifting our perception of how we do so. While bicycles may seem more aligned with “old” rather than “new” mobility, bike-sharing systems are transforming the way we see bikes from a means of leisure to a viable commuting option. More than 10 years after Brazil’s first bike-sharing program launched in Rio de Janeiro, docked and dockless systems have spread throughout the country. Two cities, São Paulo and Porto Alegre, show how these systems are becoming essential elements of the urban transit network. São Paulo’s docked public bike-sharing system, Bike Sampa, has 2,600 bikes across 260 stations. According to Tembici, the private operating company for many of Brazil’s public bike-sharing systems, the majority of trips occur on weekdays during morning and evening rush hours. At these peak times, the highest demand is at the Largo da Batata bike station, next to the Faria Lima metro, one of the city’s main stations. Largo da Batata registers more than 80 percent of its trips on weekdays, mostly during peak hours, and extra bikes are kept on site to meet demand. Dockless programs have also begun to emerge in São Paulo, with the startup Yellow launching in August 2018. Little usage data exists in these early stages, but the ambitious startup clearly feels optimistic enough to plan expansion to other Latin American countries and other micromobility markets, recently merging with the Mexico City-based electric scooter startup Grin. 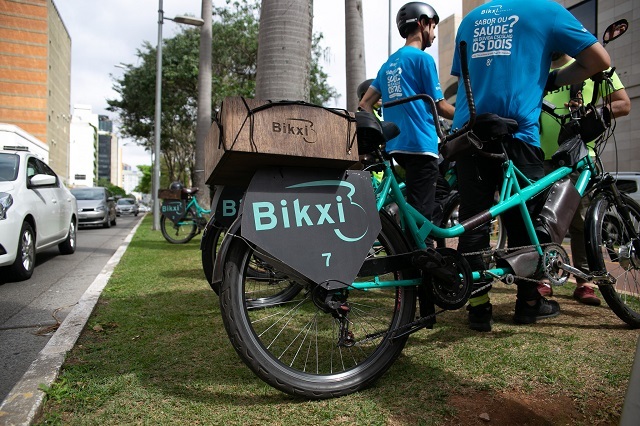 In addition to Bike Sampa and Yellow, São Paulo hosts Bikxi, an innovative company offering a bike-driven ride-hailing service. Users call for a pick-up in the app and trained drivers on electric tandem bicycles respond. 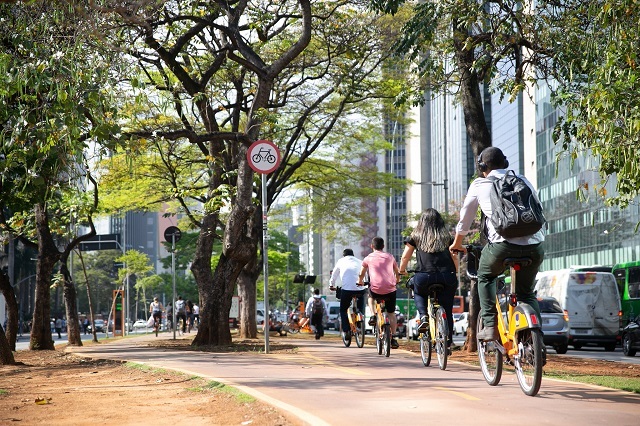 The service makes use of more than 20 kilometers of bike lanes that run along the major Faria Lima and Berrini avenues, and plans are in the works for a route along Paulista Avenue, the city’s main thoroughfare. Since its launch in 2017, the company has registered more than 26,000 trips. A survey among Bikxi users showed that most (59 percent) use the service to commute, and without Bikxi, at least 36 percent would have used a car instead (private, taxi or on-demand like Uber). For many paulistanos, biking has become a practical form of commuting, integrating with the public transport network and efficiently getting people where they need to go. 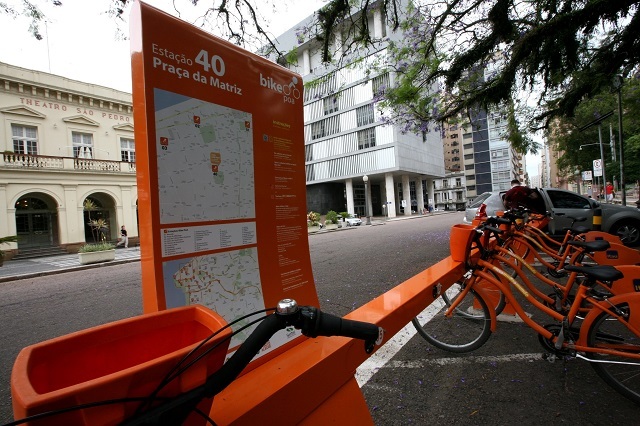 Porto Alegre sees a similar pattern in its bike-sharing program, BikePOA, another public docked system privately operated by Tembici and sponsored by Itaú Unibanco. Peak usership of BikePOA correlates with weekday rush hours. Some of the most-used stations are near the public market and the Federal University of Rio Grande do Sul, both in the city center. In 2018, these stations registered 57,000 and 61,000 weekday trips, respectively. The public market station sees its highest traffic between 7 a.m. and 9:30 a.m., when many people are arriving by bus or train on their way to work. 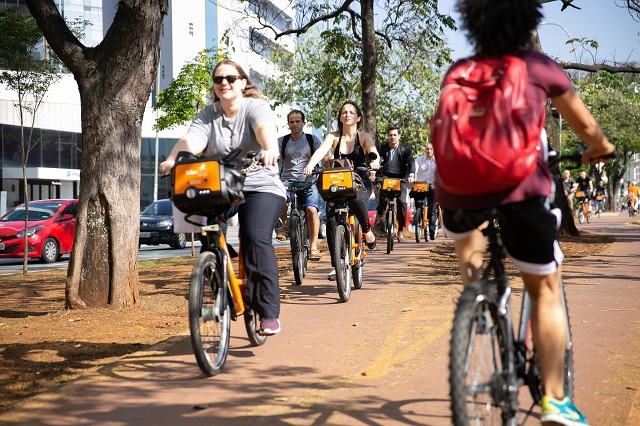 Tembici reports that the average number of trips each bike makes per day in Porto Alegre is 6.5 – higher than in European cities like Barcelona and Paris, traditionally recognized for their bike-sharing systems. While there are fewer bikes in Porto Alegre’s system than in these cities (only 410, in comparison with 6,000 in Barcelona and 18,000 in Paris), the high number of trips per day demonstrates a growing demand for cycling. When Tembici took over BikePOA operations in 2018, the company partnered with PBSC Urban Solutions to roll out key improvements, including more robust and safer bikes, more convenient docking stations, and solar-powered stations. Tembici and PBSC also made it possible for users to unlock bikes with the same card they use for the city’s public transportation. In April 2018, only a few months after the new system’s launch, BikePOA logged 40,000 trips, up from 27,000 in April 2017 and 13,000 in April 2016. In February 2019, Tembici announced a remarkable 421 percent increase in the total number of trips since it assumed operations. Loop, a still-nascent but ambitious bike-sharing startup in Porto Alegre, is an interesting hybrid between docked and dockless systems. Created by local university students and launched in late 2017 with only 12 bikes, Loop partners with local businesses and universities to create “Loop Points,” where it reserves existing bike racks instead building official Loop stations. Its long-term viability remains to be seen, but it’s yet another creative option for the city’s cyclers. As the perception of urban biking continues to shift, so does that of the daily commute. In many cities, getting to work no longer means sitting in traffic, day after day. It can now mean exercise and vitamin D. More people cycling – whether their own vehicle, a docked system, dockless startups, or even ride-hailing services – means healthier residents, less congestion and more efficient cities. A version of this blog was originally published on WRI Brasil. Priscila Pacheco is Communications Analyst at WRI Brasil. Bruno Batista is an Active Mobility Analyst at WRI Brasil.